This is my third year participating in the Bathroom Blogfest which Christine Whittemore, Simple Marketing Now LLC, directs. I list the blogs of all the other bloggers below, should you want to see additional interpretations of this year’s theme, “Climbing Out.” There are 33 this year! “I’m climbing out of natural stone,” said New York interior designer John Buscarello, ASID. Interior Design magazine named him a kitchen and bath design leader. “This change of heart has nothing to do with economics. It’s practical. And it doesn’t apply to every stone. 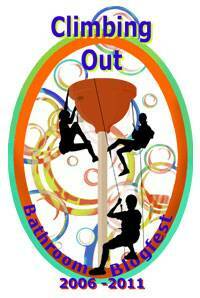 However, in the wettest parts of a bathroom, some stone doesn’t hold up well,” said Buscarello. “In its place, I select porcelains and tiles new to the market that are light-years advanced, often more moderately priced than stone and as maintenance free as you can get,” added Buscarello, photos of whose work have appeared in The New York Times, House Beautiful and Country Living, to name a few venues. Buscarello’s clients don’t restrict him to their baths and kitchens. He designs entire houses. He observes, “If someone hires me it’s not to have a beige apartment or house.” He combines colors creatively, like a skilled artist. He subscribes to a five year rule: The test of both a well-designed space and a good interior designer is what a room or home looks like after five years. John Buscarello designed all the interiors. Following are his answers to my questions. Why is natural stone hard to live with on a bathroom floor? Some characteristics of natural stone help disguise wear and dirt but because stone also has some degree of porosity, if there’s lots of iron in the water, you’ll get iron stains. 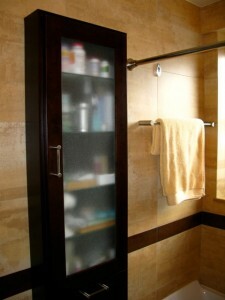 Sprays, creams and other products you use in a bathroom can also etch and wear the surface. No matter what stone you use, within a given amount of time, normal wear and tear will have some effect on the patina. This wear is not bad: Europeans are more used to the look of aged stone and understand and accept how it looks over time, but most Americans interpret the effect as old and worn out. In fact, I have dark stone in my bathroom that’s etching and driving me insane and I’m used to a distressed, worn look. So I’m moving away from specifying stone for bathroom and kitchen floors. I joined the luxury of Thassos marble on the bathroom walls with the durability of porcelain tile for the bathroom and shower floors [Left]. I like mixing elements, especially for a white-on-white effect. Further, walls don’t get the same kind of abuse that floors do. 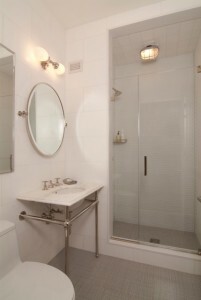 I incorporated glass tile for the shower walls because it’s easier to maintain and marble, like stone, can stain. What do you use to achieve the still-fashionable natural look? Porcelain tile. Ten years ago porcelain tile looked generic. You’d see it dress the floor of a building lobby. Engineers have since learned how to re-fire the porcelain to make great surface textures. Porcelain wears like thick glass. Five years ago, for the bath [Right ], I would have had to select Jerusalem stone or limestone. You see all porcelain tile. In addition, porcelain tiles are made large, requiring less grout. Is less grout a good thing? With fewer lines you get a clean, modern look [Below, Left]. And there’s the maintenance issue. Newer grouts tend to wear a bit less as they contain polymer that adds density and they dry faster and are more durable. These grouts come in a wider choice of colors as well. 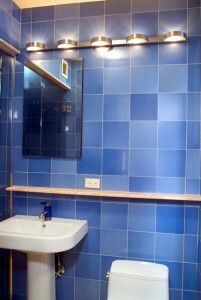 Note: While easier to maintain, the polymer grout is harder to install than the traditional kind. Do you match grout to tile color? Contrasting the color of grout with tile is dated. Install the wrong color grout and you’ll dramatically change the look of the tile so it’s best to test some samples. A small bathroom is like a jewel. Design it beautifully and don’t worry about its size because you’re most likely not going to change it. 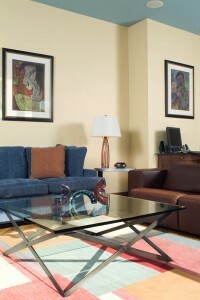 Use striking textures in interesting ways and surround yourself with colors you like. The tiles in the powder room, [Below, Right], are leather. The concept that you must have a bathtub in a new or remodeled bathroom is going out. Those who only use showers save space by eliminating the tub. I’ve noticed that people are moving away from tubs in any case. It’s easy to turn a standard shower into a steam shower and I do this quite frequently. Apart from style, which might be more sophisticated and contemporary in a city apartment, including geometric, linear patterns, where curlicues or florals might be more at home in the country, I think of location, lifestyle and wear and tear when specifying especially a floor. Natural stone will react the same way anywhere. In the suburbs in winter, homeowners drive into a garage and walk into a kitchen or bathroom with clean boots, whereas in an apartment, a person can carry salt from the street into these rooms. This fact affects what surface I’ll recommend for a floor. Do you have a question for one of America’s top interior designers? Have you regretted a remodeling, building or decorating decision because it didn’t pass John Buscarellos’ five year test? Are you a bathtub or shower person? If you could, would you climb out of your bathroom into a different one and what would you change? This entry was posted on Tuesday, October 25th, 2011 at 8:55 am	and is filed under Blogfests, Interior Design	. You can follow any responses to this entry through the RSS 2.0 feed. You can leave a response, or trackback from your own site. Jeanne, absolutely fabulous! Thank you and John for such fun, insightful, colorful [always important to me] advice. My favorite: ‘a small bathroom is like a jewel’. Same to you, CB!Thank you for putting this together for us! Speaking of jewels, the great thing about remodeling a tiny space is that you might be able to splurge on the tile, marble, stone, glass or whatever you fall in love with! Decorator Buscarello undoubtedly cuts a huge figure, not to speak of income, in his field, but even should the envisaged scary fees not be a consideration, it’s a great deal more fun doing ones own thing. This area is not short on fine shops, and when I felt forced to do something about deteriorating bathrooms, the contractor said how much he would need of X materials, suggested some quality outfits, and I did the rest. There is something to be said in favor of having ones home reflect the personality of its inhabitants and not everyone, regardless of finances, is happy to invite a stranger to take over. Fortunately for these expensive entities, we are in the minority. Another positive thing is that this is a source of employment which may not go away during a recession, assuming a healthy amount of moneyed, but lazy and/or unimaginitive people keep them on the payroll. I am sorry if you had a bad experience with an interior designer, or know of people whose homes don’t reflect their taste and personality. And perhaps you might have been one if you are pleased with the results of doing selections yourself. That hasn’t been my experience. Every single remodeling project in which we have not used an interior designer—and we’ve remodeled three bathrooms–have been OK and downright lackluster. I don’t consider myself lazy or unimaginative. Interior designers save both time and money. Take the stone and grout issues. A good designer knows practical as well as potential visual pitfalls as John does. In fact something happened to us today that will inspire a post about spending money to save money. Using an interior designer will be top of the list. They know where to look for elements in a room, they know to ask for something special that may cost no more than something else. What if you don’t have time to stroll through rows and rows of tile? An interior designer brings a range of options. You choose. If the designer is any good, he/she doesn’t create a look that relects their taste alone. I have known and worked with many interior designers on editorial or my own projects. They propose ideas–sometimes excruciatingly simple or even obvious ones–that I would never think of. It’s not surprising: That’s what they do while I’m busy doing what I do. I lived a number of years in Italy where tiles were, and perhaps still are, used almost everywhere as flooring, not just in bathrooms and kitchens, and often as decorative elements elsewhere as well. I loved the patterns and colors and hand crafted impression many of the tile arrangements gave as well as their natural cooling effect during the warm Mediterranean summers. I realize that, for reasons of economy, wood and artificial flooring substances such as vinyl and other composites are the surfaces of choice in many American homes, especially during our cold winters, but are there not now ways one can heat as efficiently with electric filaments installed below tile surfaces, as with traditional hot air or baseboard radiators and wood or plastic derivative surfaces? I lived in southern Turkey years ago and the house had terrazzo flooring throughout. It was great in summer, as you said, but a Turkish rug or two came in handy in winter. I need a lrgr tub! I think you are referring to radiant floor heat. Is there something I should know about painting my bathroom? Would venetian plaster be better than paint? Is enamel finish better than semi-gloss or flat? Is anti-mildew paint effective? Thanks Paige. Is there a resource that lists great tile installers, or for the best in an area, should a person get a reference from a tile store or interior designer? References from tile stores and interior designers are good resources. I’d also check http://www.tile-assn.com for NTCA (National Tile Contractors Association) members in your area. 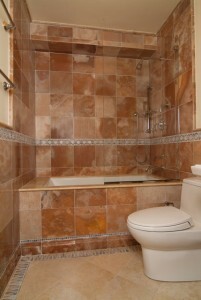 Their 5-Star Tile Contractors are the “Best of the Best” – acknowledged by their peers and customers. So much of a good tile installation is under the surface, so it really pays to use experienced tile craftsmen whose work will last the test of time. Installing tile is no different than painting, wallpapering, furniture refinishing…….success is largely in the prep work! Thanks for this crucial resource. Venetian plaster is in a class by itself – one would only use it to achieve that desired look. I have used special paint finishes successfully in the bathroom…Only issue: It is harder to touch up should any damage occur. As for the anti-mildew paint, I have no experience with it so I can’t comment. These areas are generally neglected and when not managed will ultimately invite expansion of molds. hurting yourself along with the tile, this really is an area where getting a professional service to take action makes a lot more sense. when removed following a certain amount of time.